DML’s affiliate cyber-hobby.com has found another one-off conversion to offer for German fans. This one is what appears to be a Factory No. 112 “Krasnoye Sormovo” Model 1941 or 1942 tank that was captured and hastily retrofitted with a 2 cm Flakvierling 38 mount in a fixed casemate to the roof of the hull. Personally it doesn’t seem to have been a great idea (the mount is fixed and therefore you have to turn the tank to face in the direction of fire) but I guess you use what you have. 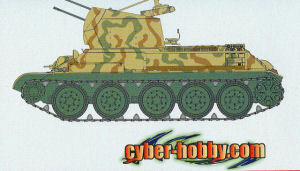 The kit combines baseline T-34 sprues with the 2 cm Flakvierling sprues from the Sd.Kfz. 7/1 kit and but 19 new styrene parts and a new set of etched brass. This kit provides the nicer “Magic Track” 50 cm “waffle” pattern tracks as well as the modified engine air exhaust grilles with your choice of either solid or etched brass grillework. The lower hull is basically a straight-up early model T-34 with rounded nose hull, “horizontal” slat air intake grilles, rectangular hatch rear plate, and pressed steel wheels with rubber tires with lightening holes around the rim. It uses the same standard DML T-34 hull pan with late-model double stops on the front road wheel mount. As previously noted the gun assembly is gorgeous. It does however only provide for fixed elevation angles of 0 or 60 degrees wheh complete. Credit for research goes to Thomas Anderson, Dan Graves, Tom Cockle and Gary Edmundson. The model comes but one finishing option: s/Pz.Jg.Abt. 653, Eastern Front, 1943 (tri-color over 4B0 green below the fenders). A tiny sheet of Cartograf decals completes the kit. Overall this is another model seen as an occasional conversion and one now available as a kit.